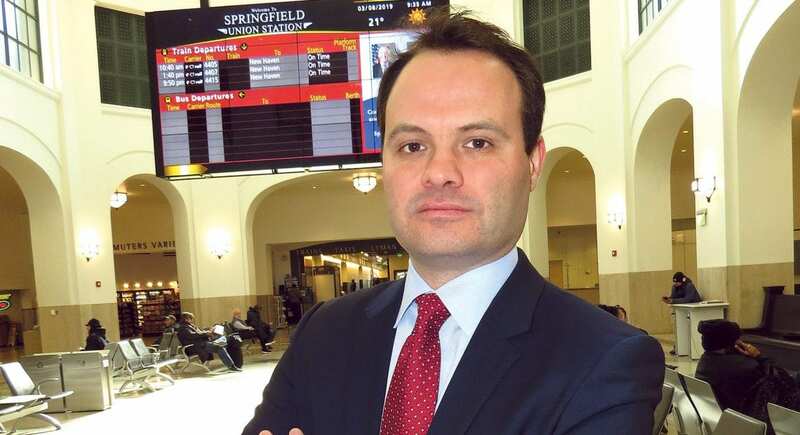 Since first elected to office five years ago, state Sen. Eric Lesser has made economic development and, more specifically, closing the wide gap in prosperity between the eastern and western areas of the state his top priority. While he’s most closely linked to high-speed rail, he’s put his name — and energy — behind a number of initiatives to bring more jobs and more vibrancy to the 413. As he talks about economic development in the Bay State, Eric Lesser focuses on most of the usual subjects — jobs, wages, taxes, incentives, industry clusters, training, and technology. But the issue he’s really obsessed with is geography. To be more specific, it’s the economic gulf that exists between east — meaning Greater Boston — and west in a state that’s only 120 miles wide. It’s a huge gulf, and since he was first elected to the state Senate in 2014, Lesser has devoted most of his waking hours to somehow closing it and enabling the four western counties to look and feel more like those east of Worcester, at least from a jobs and overall vibrancy perspective. This broad goal has been the inspiration for dozens of bills and initiatives, ranging from high-speed rail service that would connect Boston and Springfield to more recent endeavors such as legislation that would pay $10,000 to individuals willing to move to Western Mass. and work remotely, and another bill that would funnel $87 million in incentives that General Electric is essentially refunding to the state toward vocational education programs. But in each case, Lesser told BusinessWest, the bills were filed not to benefit Western Mass. exclusively, but the state as a whole, said Lesser, chair of the Legislature’s Manufacturing Caucus and also its Gateway Cities Caucus. As an example, he cited the issue he is perhaps most closely associated with — high-speed rail service, again the focus of ongoing study. Lesser said there is a good reason for his preoccupation with rail — actually several of them. Indeed, both research and recent events show there a strong relationship between rail service and seizing opportunities within the broad realm of economic development, he said, citing several once-struggling cities within the Commonwealth as examples. “The Wall Street Journal did a detailed report on this about a year and a half ago,” he explained. “They looked at Lowell, Lawrence, Worcester, and Springfield and determined that recovery from the Great Recession was greatest in those gateway cities that were connected by rail service. Likewise, the legislation involving incentives to move west would help this region because it would bring more young professionals with buying power to the area, but it would also help the Greater Boston area by giving remote workers for companies based there a more affordable option for living in the Bay State. Overall, the energetic Lesser is committed to helping this region not only regain some of the prominence it enjoyed when it was a center for precision manufacturing and had tens of thousands of people working in that sector at the Springfield Armory and several private companies, but thrive in a modern, technology-driven economy fueled by innovation and entrepreneurship. 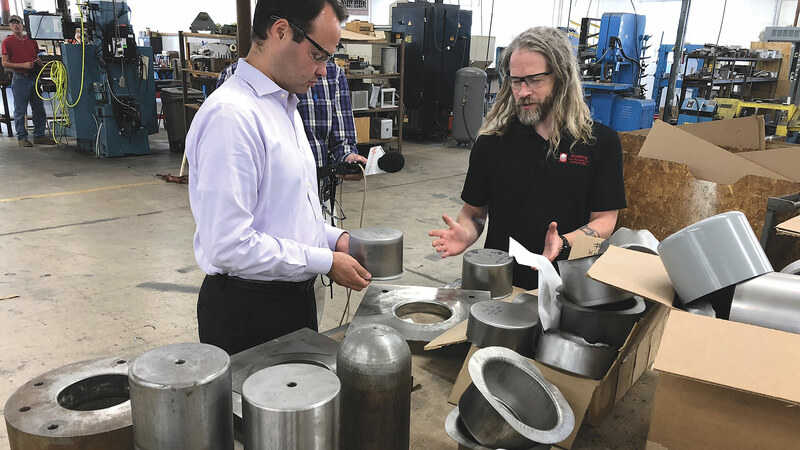 Eric Lesser says a strong precision-manufacturing sector is one of the region’s many assets, and one that should be leveraged in the years and decades to come. And as he goes about that assignment, he sees a number of links between the past and the future. Indeed, when one of the young entrepreneurs speaking at the State of Entrepreneurship event staged last month at Valley Venture Mentors opined that Western Mass. could be the next Silicon Valley, Lesser, when it was his turn to talk, said this region was Silicon Valley not so long ago, at least in terms of industrial innovation and ‘firsts’ — everything from the Blanchard lathe to the monkey wrench — due to a strong culture of entrepreneurship. It is becoming that again, but has a ways to go, he told BusinessWest, specifically when asked if this region could become home to many of the large corporations now based in and around Boston. Overall, to play a more prominent role in today’s IT-driven economy, this region needs some help in the broad and critical realm of connectivity, he went on, adding that this help could come in the form of a high-speed rail connection, funding to help vocational high schools reduce or eliminate their waiting lists for some programs, and, yes, even incentives for individuals to relocate here. 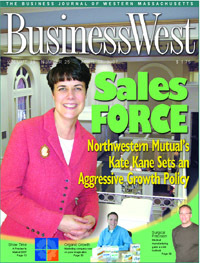 For this issue, BusinessWest talked at length with Lesser about how his primary focus since being elected to office is doing just that. As he talked about the gulf that exists between east and west, Lesser, whose district includes roughly half of Springfield, more than half of Chicopee, and several smaller towns east of Springfield, provided a quick history lesson in how things came to be this way. “In the 1980s, we had a manufacturing-oriented economy here that emptied out over the course of the 20 or 30 years since then,” he explained, referencing the closing, relocation, or downsizing of stalwarts such as American Bosch, Chapman Valve, Westinghouse, Monsanto, and others. “Those companies used to employ thousands each, and most of those still lie empty. Boston and Eastern Mass. had the same phenomenon — in fact, the whole country saw it; there were major manufacturing centers in the Boston area that also emptied out. And while jobs have left, so too have people. Lesser noted that Holyoke, in its heyday as a paper and textiles mecca, had a population of close to 60,000; today it’s around 40,000. Springfield once had 190,000 residents; today the number is closer to 160,000. And while the populations are getting smaller, they’re also getting older, and it’s not just the urban centers. “They’re talking about closing schools in communities all across my district — in Granby, in Wilbraham-Hampden, even in Longmeadow, where they’re talking about closing one of the two middle schools,” he told BusinessWest, adding that these smaller, aging populations are reaching a critical stage. And Lesser has brought forth a number of new ideas since first elected, many of them focused on replacing the jobs that have been lost in this region, drawing more young people to the 413, and building the entrepreneurial ecosystem in the Valley. He wants to replace jobs lost by bolstering the region’s already-strong manufacturing sector with education and training programs aimed at retaining jobs and adding new ones. And at the same time, he wants to build a stronger workforce in this region — one that will eventually attract more employers — by making it easier to work for the companies in and around Boston, but live here. Which brings us back to high-speed rail. The matter has been studied, but Lesser fought hard for and eventually helped win funding to get it studied again. He’s confident that the study will reveal what he firmly believes — that such rail service is a worthy investment for the Commonwealth because of the benefits that will come from bringing Greater Boston and Greater Springfield closer together, figuratively speaking. 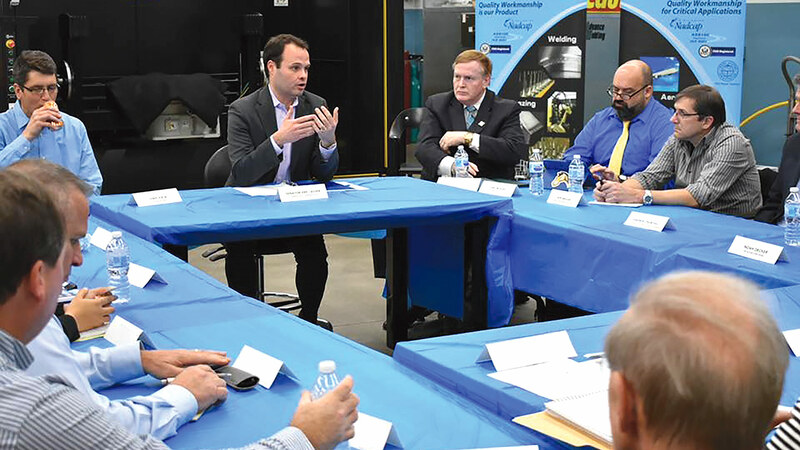 Eric Lesser, seen here at a recent roundtable with manufacturing and vocational-education leaders, says the state must do something to ease the long waiting lists for vocational programs. “Rents are out of control in Boston, the traffic is asphyxiating, they need relief from that, and we offer that in Western Mass.,” he explained, adding quickly that he does not believe Boston-area prices will come to the 413, as they have in parts of Rhode Island and other regions of this state. As he referenced the region’s proud history as an advanced-manufacturing hub, Lesser said this sector remains one of its strengths. However, its status is threatened by a number of sustainability challenges, especially when it comes to the workforce. “Right now, in the Pioneer Valley, you have thousands of vacant positions in advanced manufacturing,” he noted. “And the reason they’re vacant is because you have wait lists at all our voke schools; they can’t produce graduates fast enough to keep up with the growth. Thus, the legislation regarding those GE incentives, filed just last month, is an example of that creative, aggressive thinking that Lesser mentioned earlier, and an example of initiatives aimed at benefiting not just Western Mass., but the state as a whole. It’s a measure that triggered a discussion about the prudence of granting large incentives for relocation to companies like GE, when, in Lesser’s opinion, there are plenty of better ways to invest those tens of millions of dollars. “The idea behind that money was to create jobs,” referring to the more than $150 million awarded to GE as an incentive to move from Connecticut to Boston and invest in new facilities there. “But it was creating almost entirely high-paying, white-collar jobs in an area of the state that is already producing a lot of high-paying, white-collar jobs. We desperately need middle-class jobs in all the regions outside of Boston, which already has a red-hot economy. He said the measure has garnered a considerable amount of support since it was filed, and from across the state — not surprising given the priority placed on training workers for the manufacturing sector by both the Manufacturing Caucus and the Gateway Cities Caucus and efforts to get more CTE funding. Such efforts have been going on for years, and the momentum created by such efforts, as well as changing views about granting incentives to large corporations that often don’t bring all the jobs they promise or want too much in exchange for them, may be prompting some rethinking when it comes to how this state might invest in economic development. While awaiting an answer to that question, Lesser will also see if there is sufficient support for legislation that has come to be called his ‘go west’ bill, one that would award $10,000 to individuals willing to relocate to Western Mass. and work remotely. It was sparked, he said, by both the ongoing and accelerating trend toward professionals working remotely, and also those alarming demographic trends cited earlier involving populations getting smaller and older. Instead, he wants them to get larger and younger. Lesser enthusiastically points to an analysis of that bill authored by Hans Despain, chair of the Economics department at Nichols College, who praised Lesser’s focus on remote jobs, especially those in the FIRE (finance, insurance, and real estate) sector, and projected a benefit to the region of $60,000 for each individual who goes west. When asked about whether energies should be put toward incentivizing the next GE — if there is one — to locate in the western part of the state or another still-struggling region like the New Bedford area, Lesser reiterated his contention that Greater Springfield simply couldn’t contend for such a prize at this moment in its history — for the very reasons that have prompted all those measures that have come off his desk. “We can’t bring a GE here until we make the investments, until we make the decisions we have to make that have, quite frankly, been kicked down the road far too long,” he told BusinessWest. “We need to invest in connectivity; we need the rail service. We need to continue to invest in our workforce and our local communities so we’re producing the skilled workers who can work at those companies. That can only happen if there’s a workforce, and if the gulf between east and west can be bridged. These are the hard facts that drive Lesser as he tries to engineer a solution to this long-standing problem.